On Sunday, September 10th, Steve will be performing his close up magic and creating balloon animals for everyone from 10AM to 11Am just before the Autism Speaks Walk which will take place at Fendley Park in Orangeville, Ontario. So put on your Walking Shoes and I hope to see you there!! On Saturday, September 16th and Sunday, September 17th, Doc Century’s Magical Travelling Medicine Show will be returning to Upper Canada Village near Morrisburg, Ontario. 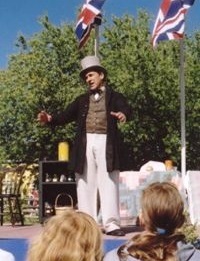 Come sample some of Doc’s famous Golden Medical Discovery 3 times a day in Magic Shows at 12 noon, 2pm and 3:45pm in the historic setting of the 1860s. Please visit www.uppercanadavillage.com to see all the wonderful events they have all year round: get pulled in the Tow Scow, pet a Sheep, tour the Village, enjoy dining at Cooks Tavern, The Village Cafe, Willards Hotel and the Harvest Barn. Hope to see you there at this year’s Fall Fair!! On September 30th, The Great Steverino will returning to the Dundalk Family Fun Festival. 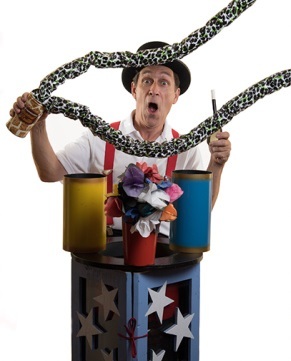 Steve will be performing Strolling Magic from 11am to 12 Noon and then putting on a Family Magic Show at 12:15pm. Lots of fun for the whole family. Hope to see you at the Family Fun Fair! !